When compared with Know Your Customer (KYC) at customer onboarding, ongoing KYC monitoring hasn’t always been as much of a priority for firms. For those that work with manual systems, it can be a laborious process to manage, but recent legal and regulatory changes mean that it’s one that can’t be overlooked. Being able to identify customers who pose an increased risk as circumstances change reduces compliance blind spots and the need for bulk remediation projects further down the line. With the onset of FinCEN’s CDD rule and MLR 2017 the emphasis is on firms to develop clear, auditable processes to manage ongoing checks. What was once best practice has moved to law, reflecting an increasing expectation from both global regulators and stakeholders that firms should be more aware of customer risk at all times. Comprehensive monitoring is only possible if you have a true picture of your customer and that means understanding the ultimate beneficial owners (UBOs). Having a reliable process in place allows firms to do better business and protect their reputations. The process of KYC monitoring is well suited for automation. Here we examine the challenges, data requirements and how intelligent process automation (IPA) will help in a number of ways, from saving time and resources to enhancing quality. When dealing with a significant volume of clients, identifying how frequently customers should be subject to KYC monitoring is an intricate process. All customers are required to be monitored but the frequency and the nature of checks should be defined by a firm’s risk-based approach. Firms working with manual systems are at a particular disadvantage when handling this process given the scale of the task. Manually scheduling ongoing checks, completing them in a timely manner and keeping a clear audit trail, requires a significant amount of organisation and human resources. Whether manual or automated, firms need strong systems to rely on. Onboarding new customers is the primary concern for a business but for a compliance team, they must also balance this with the regulatory requirement for monitoring existing relationships. Teams with limited resources may find themselves struggling with priorities especially as the front-line business teams pile on the pressure to onboard new customers quickly. Compliance teams are operating with budgets that are overstretched. Many firms are pushing to transform KYC processes that have become unwieldy and inefficient over time. Manual KYC monitoring is a prime example of an inefficient and expensive process where analysts are reviewing files scheduled for an update only to find out that nothing has changed. The whole research file must be checked using multiple data sources, potentially taking days for a large corporate entity. Compliance costs directly impact the bottom line and a cumbersome process will have a negative impact on profitability. what ongoing checks should be included? Firms need to access multiple datasets as part of the monitoring process and doing each individually can be a drain on resources. Based on your risk sensitivities, there may be some sets of data that you will monitor against more frequently than others. Here we list key data sets you should be monitoring customers against. Keep in mind too that correct data relating to the parent structures is key for truly comprehensive checks of your customers. sanctions checks are straightforward and fast to process when you have access to the most up-to-date lists worldwide, including those from the EU and the US. Lists change regularly as people and entities are added and removed, so having access to the right data set is important for maximum efficiency. Politically Exposed Person (PEP) searches also rely on access to correct and complete global data sets. Should a PEP be identified, they would need to be flagged and reviewed by a member of your risk committee, and will be subject to enhanced due diligence. monitoring UBOs of your customers will flag ownership changes to identify those who would pose a higher risk to the business. This is a compliance hotspot, and missing changes would open firms up to regulatory risk. Compliance teams can struggle to keep on top of these for all customers but larger, complex corporates are a particular drain on resources. adverse media searches highlight the public profile of your customers and are a rich source of valuable information. The volume of available data from both premium sources and search engines, and high false positive rates, makes this a time consuming task when performed manually. Significant issues can be easily missed as they are lost in the volume of information. Intelligent process automation supports firms throughout the lifecycle of a client relationship. From supporting a risk-based approach to saving costs and reducing the administrative burden, here’s how firms can benefit. With only 12% of firms dynamically checking their client relationships, there is room for significant improvement. Each firm has a different requirement for the frequency of their KYC monitoring. Where manual systems restrict flexibility, automation gives firms the ability to choose the periodic frequency of checks and the data sources. encompass automatically screens a customer against all relevant sources seamlessly. Ongoing checks can sometimes feel like looking for a needle in a haystack. Many firms start from scratch each time monitoring checks are scheduled wasting huge amounts of time. The automation of monitoring means that teams are alerted when there is a change so that focused action can be taken using detailed findings. Following a risk-based approach ensures firms can prioritise high risk customers and use their resources effectively. Automation gives firms the tools to implement their risk-based approach at a detailed level. Customers can be moved up, or down, the risk levels based on your own criteria as intelligent process automation identifies issues. encompass provides further flexibility by being able to customise this at both an individual customer and entity level. As with all data rich processes, good administration is essential. Compliance teams will drive efficiencies for ongoing KYC monitoring by accessing all necessary data in a single centralised platform that can dynamically create a clear auditable trail. Automation further adds to this by providing actionable management information reporting and records that are always synchronized. As compliance teams are tasked with doing more with less, automation of this cumbersome process frees up resource for other business-critical work. Removing manual processes and streamlining the workflow across the business will positively impact the bottom line. encompass helps customers monitor, detect and assess client record changes regardless of the source of the change. Integrating with the world’s leading global data providers your entire customer base is automatically monitored for changes against your trusted sources. Contact us to find out more. 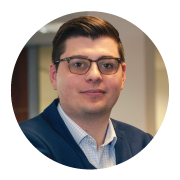 Scott is our Head of Customer Success here at encompass and regularly speaks with our users directly on the ins and outs of the software. Scott has over 10 years of customer relationship experience within the technology space and is responsible for the entire customer journey here at encompass, from on-boarding, implementation, training and on-going technical support.